We all know the story of Cinderella at this point. The evil stepmother, the awful stepsisters, the charming prince, the literally magical night at the ball. The stroke of midnight, the stranded glass slipper and the search for the foot that fits into it. A classic story of true love that has been told multiple times before, and while not a fault by director Kenneth Branagh, this is precisely the one problem I have with the brand new version out in theaters now. Part of the magic I look for in a cinematic experience is directly related to that fresh feeling of discovery that washes over me, and the fact that this was practically entirely missing despite it being a brand new film felt disappointing. Okay, so I started off this review with a negative tone. Let's get back on track here, because that is pretty much the only complaint I can come up with here, the fact that I watched the animated classic relatively recently so a nagging feeling of redundancy was seeping out of every scene, but really you could argue that is not a flaw at all, it just comes with the territory of applying a brand new shiny coat to a previously painted masterful work. Looking solely at what was achieved here, it's a pretty wonderful film that can be appreciated by people of all ages. 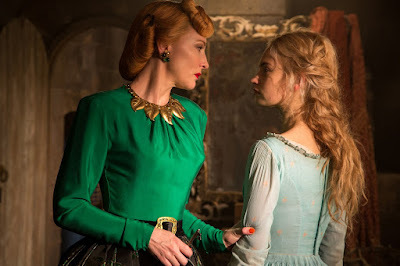 The casting across the board in Cinderella is spot on, with a timelessly beautiful lead performance from Lily James, a rock solid turn by the recognizable to Game of Thrones fans Richard Madden as the Prince, and probably the greatest of the bunch being Cate Blanchett as a pitch perfect evil stepmother. Branagh directs the hell out of this film and despite knowing what was coming around every turn, the scenes that were striving for emotional resonance were all home runs in my book as I was often times moved by the very natural feeling pain felt by the characters. Despite being roughly 11 months away from the next Oscars, I can pretty much guarantee we have a contender here for a couple of specific nominations. 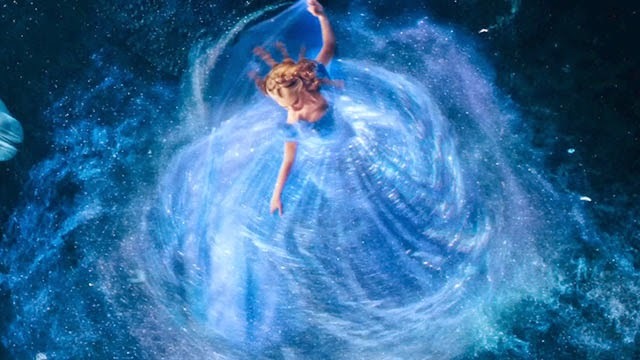 The production and costume design on display throughout Cinderella was the result of pure magic, a gorgeous aesthetic that never took a scene off. Even the set pieces that were intended to be dour and depressing, like the attic Cinderella is relegated to by her stepmother, has a certain charm to it and the glow of sunlight breaking through the ceiling reminds us of the warmth and optimism of Cinderella that she learned from her late parents. Even at the worst of times, never forget to have courage and be kind. You could really feel these words reverberate throughout the movie, and I was happy to have my daughter experience this important message again on the big screen. If you have any interest at all in the classic tale of Cinderella, I strongly suggest you check this one out. Even if you don't have interest, might want to give it a look and keep an open mind. You just might be surprised at how infectious the magic is. and what did the daughter think ? Oh she loved it sir, put my respect and admiration for it to shame. She kept saying last night how she was going to build her own carriage when she came home from school today.